The crowds turned up, the sun came out, and traders reported brisk business at the Kent County Show in Detling today. But despite the good weather, there was concern about the future of farming in the south east. Tom spoke to Kevin Attwood, the chairman of the Kent Agricultural Society and Environment Minister, Therese Coffey. His report also has reaction from visitors to the show. Fourteen pigs have been stolen from a farm in the New Forest. The animals were taken some time between Monday evening and Tuesday morning from South Allenford Farm in Fordingbridge. Each one is tattooed with a specific marking on the shoulder. Interview with farmer Robert Shepherd. A celebration of rural life is underway in Sussex at the South of England show. For many Jersey Royal new potatoes are a delicious eat. They are also a sign that Spring is here, even if the weather suggests otherwise. Supermarkets are stocking up with the potatoes; 40,000 tonnes are handpicked every year with farmers packing up 80 bags a minute, 24 hours a day. Our reporter Wesley Smith has been to see the Jersey Royal's journey from field to fork. Farmer asks: could you adopt some of my hens? Have you ever kept hens? No? Well now's your chance! A farmer in Sussex needs to find new homes for thousands of them. Regulations on egg producers force them to get rid of the birds when they're only 18 months old. Usually they're slaughtered. But Susie Macmillan is determined that her hens should live out their days peacefully. Malcolm Shaw reports. The farm's link is here. Ideal weather conditions have resulted in one of the best apple crops in living memory. Early summer sun, a wet August and warm September mean some varieties will have a record breaking year. Sarah Saunders spoke to Tonbridge apple farmer James Simpson and Adrian Barlow of the growers group English Apples and Pears. Fruit farmers are warning that the introduction of the National Living Wage could mean they can't afford to hire seasonal labour. And without the pickers, the fruit would be left to rot on the trees. But politicians say to pay all workers the going rate is essential. John Ryall spoke to Kent fruit farmer David Figgis and the Conservative MP for Bexhill and Battle, Huw Merriman. Police are appealing for information after a flock of sheep were killed and injured on a farm in Sussex. 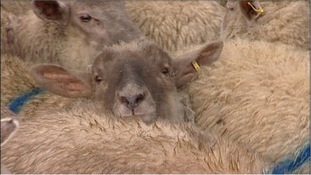 It's thought the ewes - mostly expecting lambs - were attacked by dogs. Nine died and many more were seriously hurt. Sheep worrying is a constant menace for farmers across our region. Now dog owners are being warned to keep their pets under control, or face prosecution. Malcolm Shaw reports.